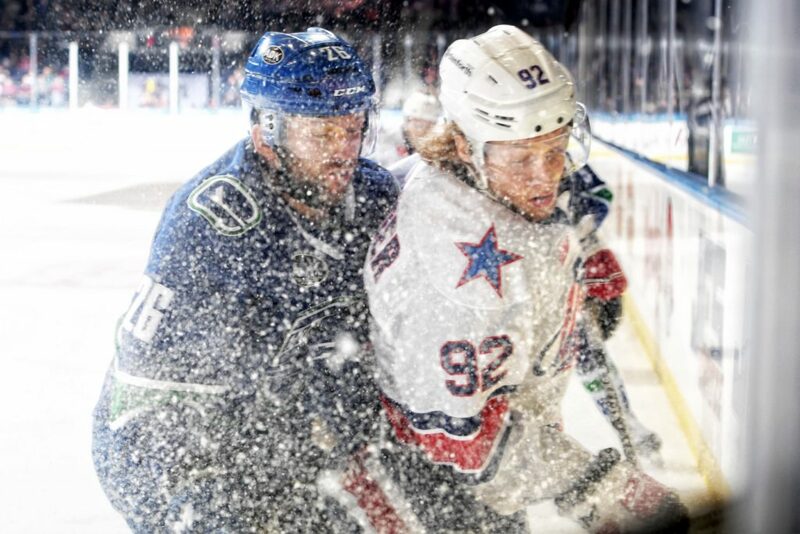 Alex Nylander is Playing a Confident Game this Season · Let's Go Amerks! 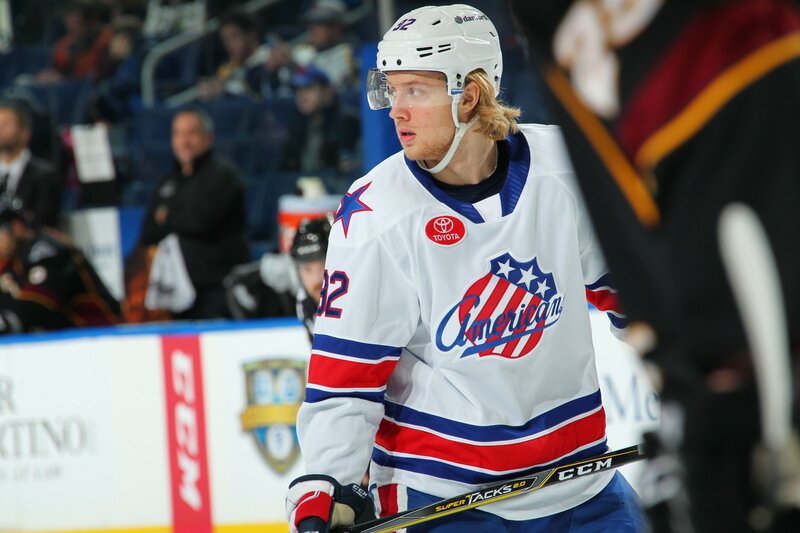 There isn’t a player in a Rochester Americans uniform that has received as much criticism as Alex Nylander has since the start of the 2016 season. That’s also because he’s only one of three players in his third full season with the Amerks. As a first round draft pick in 2016 NHL draft, eight overall, the expectations have been high. Through 21 games played we’re seeing his progression through consistent play that his game has reached a new level. The first two seasons there were questions from those who’ve watched him play on a nightly basis about whether or not he has what it takes but through all of that the Buffalo Sabres haven’t lost confidence in his development. He was drafted in the first round for a reason. His skating ability has never been questioned but the ability to use his body has been. In his first season, 2016/2017, Nylander spent a lot of time as an 18 year old coasting around the perimeter of the ice, often hesitant to be engaged in physical play, and turned the puck over. A lot. Through 65 games he had a respectable 28 points (10G+18A). He was also a minus-24, the worst on the team that season. His second season deserves an asterisk as he battled a groin injury the entire season and was never playing at 100%. He missed the first 14 games before returning but was never full recovered. In 51 games he had 27 points (8G+19A) and finished at a plus-3. The Sabres called him up late in the season where he played three games and had one goal. His point total increased but the determination to be engaged in a play and win puck battles continued to be an issue. A low moment of his season was game two of the Amerks playoff series when he was benched in the third period due to lack of performance. One of the lines often used by coaches and management was that he was only 18 years old. Then it was he’s only 19 years old. And then it was he just turned 20 years old. We’re all human, everyone matures differently, and professional athletes all develop in different ways. Those lines had some merit to them but they’re now in the past even though he’s still the youngest player on the team. 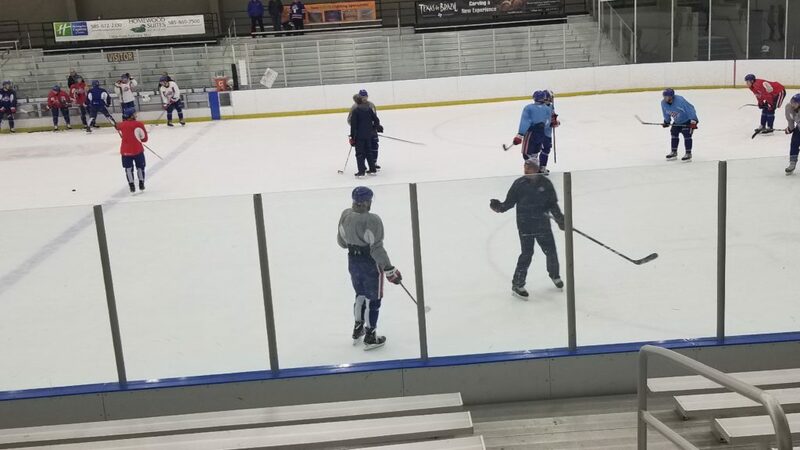 Practices often have three lines that stand out from the ice – good job, talk to each other, and hit each other. Those lines are said to everyone but they seem to stand out a lot more with Nylander. Chris Taylor pulled him aside at a recent practice (pictured above) and used some loud words (some with four letters) to reinforce the idea of playing physical instead of reaching. The key word is reinforce. Learning through repetition and reinforcement. The more it’s done in practice the more it’s done in a game and that’s what we’re seeing. Now that we’re 21 games into the third season as a 20 year old, the age many prospects start playing in the American League, we’ve seen a more confident Alex Nylander. And a healthy Nylander. Through 21 games he has 17 points (6G+11A) and is a plus-10. Point totals are great and can be hyped with X amount of points in X amount of games and look great on paper. What matters more is how those points are being accumulated. Last season the assist totals started to look good on stat sheets but how he was getting them wasn’t impressive. Sometimes it was a lost puck battle where a teammate retrieved the puck, or it was just a lucky bounce. Sometimes it was a simple pass and then two other players did all of the work. He wasn’t the one leading or creating a rush, he was following it. He’s already matched his career high for power play goals, has more primary assists than all of last season, and the plus-10 is a great indication of how much he’s winning those puck battles to create plays versus turning the puck over. That’s also a great indication that he’s playing better defensively. He’s on pace to have his best season. Everything is different about his game this season. That’s not to say it’s perfect, it rarely is for anyone, but the way he’s working at pucks along the boards and coming out with them, driving the net, and not hesitating to go into the corners is something we had rarely seen on a consistent basis through his first 119 games in the American League. Here’s some examples of what he’s done this season that have stood out. Against Binghamton on November 24 he skated away with the puck along the boards and sent a perfect pass to Kevin Porter in the slot for a goal. With three players closing in on him during this game on November 18 against Hartford he was able to get the puck out to Zach Redmond for a pass to Lawrence Pilut and a goal. A season or two ago this would have result in hesitation and likely a turnover. Andrew Oglevie scored the goal on the play below but it’s a great example of Nylander using his body against a defender to keep the play going and going straight to the net. In previous years this play would have been him chipping the puck into the corner or backing away. This is another example of using his speed and body to protect the puck as he went to the net. A bad bounce for Utica resulted in the goal but the opportunity for that to happen was created by him going to the net. Better decisions have also resulted in assists on game winning goals. There was a chance to shoot the puck on this play but he was able to see Zach Redmond with a better shot. Smarter play versus selfish play. Empty net goals are another stat on paper that can have more details behind them. Binghamton ended up scoring a goal late in the game and that turned out to be the game winning goal. One thing that has never been questioned is his ability to shoot the puck. He has the skill to find open ice and when he gets the puck in those positions he’s going to score. During practices one of the coaches will always remind him if he starts to stray from that spot down low. It’s one of the best areas of his game. Down by five goals there wasn’t time to hang the head and just coast to get out of Hartford. Found a spot, received a pass, scored a goal. Could I find some bad turnovers or bad plays? Yes. What’s different is how he’s reacted by just getting back out onto the ice for the next shift and making up for it. If anyone is still soured on his play based on the first two seasons you’ll want to leave that behind and watch him play with a fresh set of eyes.